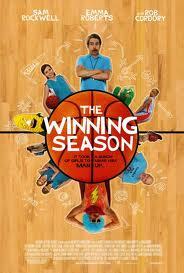 I needed a net-fix so I gave Winning Season a try solely because of Sam Rockwell. I was fully prepared for the movie to be a blatant Bad News Bears Rip off so when it started out that way I didn’t pay any attention. Surprisingly, The movie comes into its own fairly quickly and though Rockwell is certainly the strength of the film I found myself pretty interested and actually enjoying the movie. Sam Rockwell is readily introduced as a drunk who works nights as a busboy. He is quickly reconnected to a former classmate/athlete who runs their Alma Mater and is desperate to find a new coach for the girls basketball team. So, he takes the job, but hates it and doesn’t take the girls seriously. Meanwhile, his daughter who plays basketball for another school, hates him. So, the story pretty much writes itself after that, except watching Rockwell’s tenacity as a coach and his teams dedication to him even after he gets fired is really something, and the overall turnaround for the character and a well executed ending make it a worthy view. First of all, I do give it full marks for story. It could have very easily been a rehash of the same old sports movie routine and while it still had those common elements, its individuality outshines its derivative genre aspects. That combined with Sam Rockwell holding it down in the lead really makes the movie worth watching. It’s not perfect. a lot of the acting from the girls is corny and forced. Not great dialogue may be a factor, but the performances at times are reality-show-awkward. The story is not particularly clever, but original enough to not just re-watch Coach Carter, or something. Unless you want to have a battle of the Sams. (Nick Fury against Justin Hammer?) Thankfully, it’s not so overwhelmingly awful that the really entertaining parts can’t be enjoyed and overall I give it a solid B.